Established in 1994 and based out of Rochester, New York, the Kink Bike Company is a relative newcomer to the world of BMX bikes, but in such a short time they have built quite a reputation as making quality, durable BMX bikes for everyone from beginners to seasoned veterans of BMX. Kink Bike Company BMX bikes are ridden and endorsed by several superstars of BMX in the X-Games, Mountain Dew Tours, as well as appearing in numerous magazines and videos worldwide. The Kink 2012 Whip BMX Bike continues the tradition of quality that Kink BMX Company has worked so hard to create. 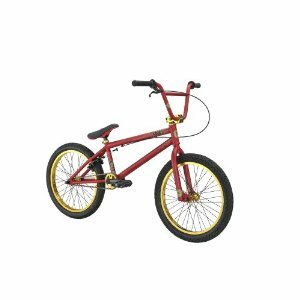 The Kink 2012 Whip BMX Bike is a very popular bike and it is easy to see why. It is a very light and very sturdy BMX bike that is 100% Chromoly. The color and design is awesome, the bearings are fully sealed, and it handles great. The Kink 2012 Whip BMX Bike was designed with the intermediate rider in mind, who is looking to take their skills to the next level be it on the street, on the ramps or just on the trails. It is meant to handle whatever you can throw at it. While it is meant for intermediate riders, it is also a great bike for beginners since it allows for a lot of room to grow while not being too much – skill or price wise. The stock tires are not the best in the world and more advanced riders will want to replace them as soon as they can. The pedals could also do with an upgrade, but the main thing all riders should consider upgrading are the grips. Once these three parts have been replaced, you will have no problems with the bike and it will last you for years to come. There have been reports of problems with the stem slipping as well. If you can’t afford to upgrade to a new stem right away, if you experience any slipping then a thread-lock can be a good temporary fix. Despite these complaints, the Kink 2012 Whip BMX can still stand up to heavy daily use. Retailing for just under $400, you will be hard pressed to find a BMX bike with everything sealed, and as lightweight and durable as the Kink 2012 Whip BMX Bike is. The quality of the Kink 2012 Whip BMX Bike is easily comparable to other bikes that will retail for between $700 and $800 so you are getting a very good bang for your buck. This bike has nothing but positive reviews on the web and almost everyone that has ridden this BMX has had a positive experience. We think this is the best BMX we have reviewed so far this year. 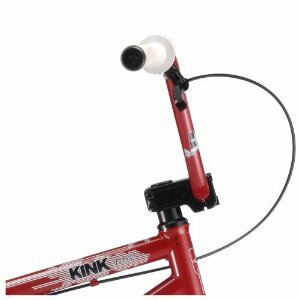 This entry was posted in Bikes, BMX, Kink, Reviews and tagged Kink, Kink 2012 Whip BMX Bike, Kink BMX Bikes. Bookmark the permalink.